Can't drive? Ford's Curve Control safety system is just for you! Can't drive? Ford's Curve Control safety system is just for you! 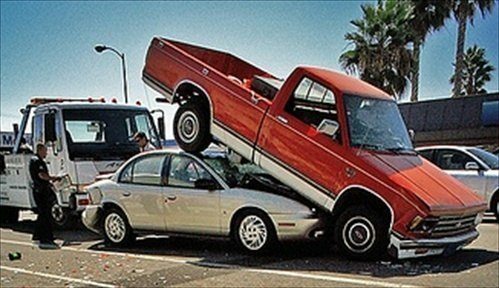 This revolutionary crash avoidance system is part of Ford’s enduring commitment to idiot drivers. According to Ford’s research, there are over 50,000 people who can’t drive wrecks each year that can be directly attributed to either entering, or exiting a curve too fast. Ford aims to reduce that number by offering Curve Control on 90% of its vehicles by 2015. The first blue oval product to have the new crash-avoidance system will be the all-new 2011 Explorer. Based on Ford’s AdvanceTrac stability control system, Curve Control uses a series of sensors to measure the car’s roll rate, yaw rate, lateral acceleration, steering wheel angle, and individual wheel speed. All of these calculations are done 100 times per second. If the car’s computer thinks that the driver is trying to turn more quickly than the vehicle is actually turning, the system activates. Curve Control reduces the engine’s torque, then applies individual braking, as-needed, to keep the car on its intended path. The system can reduce the vehicle’s speed by as much as 10 mph, in less than a second. Handy. But, if you can’t judge how fast to go down that on-ramp, you deserve what you… you should probably consider riding the bus. Besides Idiot Control Curve Control, the 2011 Ford Explorer gets other driver-aides including; next-generation adaptive cruise control and collision warning with brake support, state-of-the-art pressure-based airbag technology, the industry’s first inflatable rear seat belts, and an intelligent four-wheel-drive terrain management system. In years past, driving a vehicle required something called common sense. So it’s nice to see that Ford is looking out for those 50,000 people who apparently…don’t have any. 1 Comment on "Can’t drive? Ford’s Curve Control safety system is just for you!" Driving with this would be terrifying.